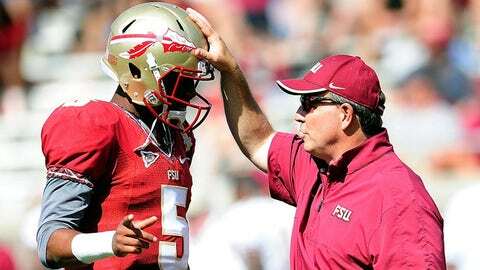 Jimbo Fisher and quarterback Jameis Winston (left) have led Florida State to a 13-0 record. TALLAHASSEE, Fla. — From Alabama to Auburn to Florida and LSU, the Southeastern Conference has been unstoppable in the BCS championship game the past seven seasons. As much as Alabama fans chanted ”Roll Tide!” the past two seasons, they were also cheering ”S-E-C!” on the way to a national title. Throw out the Alabama-LSU matchup for the 2011 national title, and the rest of the nation is 0 for 6 against the SEC with a crystal football on the line. So now many college football fans are wondering: can top-ranked Florida State stop the seven-year itch and halt the SEC’s dynasty? 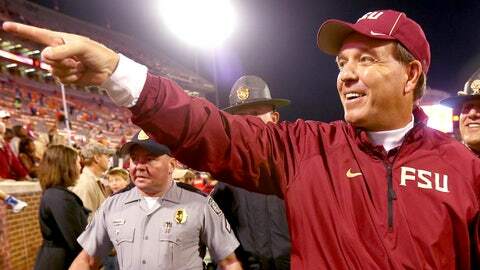 Jimbo Fisher signs an extension with Florida State just a week before the No. 1 Seminoles play Auburn in the BCS championship game. It’s the granddaddy of all questions. And, of course, we’ll find out on Jan. 6 when Florida State and Auburn play in Pasadena, Calif. But it’s also brought up an interesting storyline: Did Jimbo Fisher pattern the rebuilding of Florida State as an SEC-style program? Fisher may not think so — or be willing to admit it – but there are plenty of ties between Florida State and the SEC. Florida State is an Atlantic Coast Conference team, but Tallahassee is located in the heart of SEC country with Gainesville 150 miles to the southeast and Auburn about 200 miles north. Fisher was an SEC assistant for 13 years, first at Auburn 1993-98 and then at LSU from 2000-06. He’s rebuilt Florida State by using his recruiting ties within Florida but also in Alabama. He grabbed defensive coordinator Jeremy Pruitt off the Crimson Tide staff after they won a second national title, and recruiting coordinator Tim Brewster was previously at Mississippi State. Of the six assistant coaches Fisher hired in the offseason, five of them left an SEC school to come to Tallahassee. Some programs would consider it the ultimate compliment, that their team or program is compared favorably to an SEC school. But Fisher and the Seminoles bristle at the idea that they were patterned after the SEC. And when it comes to beating an SEC team, Florida State players have lived by the motto this season that ”our opponent has no face.” The philosophy is to respect the opponent but prepare and focus more on yourself. And the opponent’s conference. To win a championship, the road goes through an SEC team. Even the best from around the nation have fallen short. Notre Dame was unbeaten in 2012 only to be dismantled by Alabama last season. Oregon had one of the nation’s most potent offenses but was grounded by Auburn in 2010. Alabama put away Texas a year before. This Florida State team may be built to stop the SEC’s reign. The Seminoles have an offense that averages 53 points per game. The defense, which features plenty of muscle up front from an SEC-sized defensive line, holds opponents to just 10 points per game, best in the nation. The majority of the Seminoles are from the Sunshine State, but they have made inroads by grabbing a few stars from Alabama the past few years. Even Heisman Trophy winner Jameis Winston grew up in Bessemer, Ala., just a short drive from Alabama (37 miles) and Auburn (101 miles). Winston grew up on the Alabama-Auburn rivalry. He was recruited by both schools, making an official visit to Alabama, before eventually choosing Florida State. He has plenty of friends on the Auburn team, but he’s not interested in the SEC-ACC chatter. You can follow Bob Ferrante on Twitter @bobferrante or email him at bobferrante17@gmail.com.